Many people associate solar electricity generation directly with photovoltaics and not with solar thermal power. Yet large, commercial, concentrating solar thermal power plants have been generating electricity at reasonable costs for more than 15 years. Volker Quaschning describes the basics of the most important types of solar thermal power plants. Most techniques for generating electricity from heat need high temperatures to achieve reasonable efficiencies. The output temperatures of non-concentrating solar collectors are limited to temperatures below 200°C. Therefore, concentrating systems must be used to produce higher temperatures. Due to their high costs, lenses and burning glasses are not usually used for large-scale power plants, and more cost-effective alternatives are used, including reflecting concentrators. The reflector, which concentrates the sunlight to a focal line or focal point, has a parabolic shape; such a reflector must always be tracked. In general terms, a distinction can be made between one-axis and two-axis tracking: one-axis tracking systems concentrate the sunlight onto an absorber tube in the focal line, while two-axis tracking systems do so onto a relatively small absorber surface near the focal point (see Figure 1). The theoretical maximum concentration factor is 46,211. It is finite because the sun is not really a point radiation source. The maximum theoretical concentration temperature that can be achieved is the sun’s surface temperature of 5500°C; if the concentration ratio is lower, the maximum achievable temperature decreases. However, real systems do not reach these theoretical maxima. This is because, on the one hand, it is not possible to build an absolutely exact system, and on the other, the technical systems which transport heat to the user also reduce the receiver temperatures. If the heat transfer process stops, though, the receiver can reach critically high temperatures. Parabolic trough power plants are the only type of solar thermal power plant technology with existing commercial operating systems until 2008. In capacity terms, 354 MWe of electrical power are installed in California, and a plenty of new plants are currently in the planning process in other locations. The parabolic trough collector consists of large curved mirrors, which concentrate the sunlight by a factor of 80 or more to a focal line. Parallel collectors build up a 300–600 metre long collector row, and a multitude of parallel rows form the solar collector field. The one-axis tracked collectors follow the sun. The collector field can also be formed from very long rows of parallel Fresnel collectors. In the focal line of these is a metal absorber tube, which is usually embedded in an evacuated glass tube that reduces heat losses. A special high-temperature, resistive selective coating additionally reduces radiation heat losses. In the Californian systems, thermo oil flows through the absorber tube. This tube heats up the oil to nearly 400°C, and a heat exchanger transfers the heat of the thermal oil to a water steam cycle (also called Rankine cycle). A feedwater pump then puts the water under pressure. Finally, an economizer, vaporizer and superheater together produce superheated steam. This steam expands in a two-stage turbine; between the high-pressure and low-pressure parts of this turbine is a reheater, which heats the steam again. The turbine itself drives an electrical generator that converts the mechanical energy into electrical energy; the condenser behind the turbine condenses the steam back to water, which closes the cycle at the feedwater pump. It is also possible to produce superheated steam directly using solar collectors. This makes the thermo oil unnecessary, and also reduces costs because the relatively expensive thermo oil and the heat exchangers are no longer needed. However, direct solar steam generation is still in the prototype stage. In contrast to photovoltaic systems, solar thermal power plants can guarantee capacity (see Figure 2). During periods of bad weather or during the night, a parallel, fossil fuel burner can produce steam; this parallel burner can also be fired by climate-compatible fuels such as biomass, or hydrogen produced by renewables. With thermal storage, the solar thermal power plant can also generate electricity even if there is no solar energy available. A proven form of storage system operates with two tanks. The storage medium for high-temperature heat storage is molten salt. The excess heat of the solar collector field heats up the molten salt, which is pumped from the cold to the hot tank. If the solar collector field cannot produce enough heat to drive the turbine, the molten salt is pumped back from the hot to the cold tank, and heats up the heat transfer fluid. Figure 3 shows the principle of the parabolic trough power plant with thermal storage. The efficiency of a solar thermal power plant is the product of the collector efficiency, field efficiency and steam-cycle efficiency. The collector efficiency depends on the angle of incidence of the sunlight and the temperature in the absorber tube, and can reach values up to 75%. Field losses are usually below 10%. Altogether, solar thermal trough power plants can reach annual efficiencies of about 15%; the steam-cycle efficiency of about 35% has the most significant influence. Central receiver systems such as solar thermal tower plants can reach higher temperatures and therefore achieve higher efficiencies. In solar thermal tower power plants, hundreds or even thousands of large two-axis tracked mirrors are installed around a tower. These slightly curved mirrors are also called heliostats; a computer calculates the ideal position for each of these, and a motor drive moves them into the sun. The system must be very precise in order to ensure that sunlight is really focused on the top of the tower. It is here that the absorber is located, and this is heated up to temperatures of 1000°C or more. Hot air or molten salt then transports the heat from the absorber to a steam generator; superheated water steam is produced there, which drives a turbine and electrical generator, as described above for the parabolic trough power plants. Only two types of solar tower concepts will be described here in greater detail. The first type of solar tower is the open volumetric receiver concept (see Figure 4a). A blower transports ambient air through the receiver, which is heated up by the reflected sunlight. The receiver consists of wire mesh or ceramic or metallic materials in a honeycomb structure, and air is drawn through this and heated up to temperatures between 650°C and 850°C. On the front side, cold, incoming air cools down the receiver surface. Therefore, the volumetric structure produces the highest temperatures inside the receiver material, reducing the heat radiation losses on the receiver surface. Next, the air reaches the heat boiler, where steam is produced. A duct burner and thermal storage can also guarantee capacity with this type of solar thermal power plant. The volumetric pressurized receiver concept (see Figure 4b) offers totally new opportunities for solar thermal tower plants. A compressor pressurizes air to about 15 bar; a transparent glass dome covers the receiver and separates the absorber from the environment. Inside the pressurized receiver, the air is heated to temperatures of up to 1100°C, and the hot air drives a gas turbine. This turbine is connected to the compressor and a generator that produces electricity. The waste heat of the gas turbine goes to a heat boiler and in addition to this drives a steam-cycle process. The combined gas and steam turbine process can reach efficiencies of over 50%, whereas the efficiency of a simple steam turbine cycle is only 35%. Therefore, solar system efficiencies of over 20% are possible. In contrast to the parabolic trough power plants, no commercial tower power plant exists at present. However, prototype systems – in Almería, Spain, in Barstow, California, US, and in Rehovot, Israel – have proven the functionality of various tower power plant concepts. The minimum size of parabolic trough and solar tower power plants is in the range of 10 MWe. Below this capacity, installation and O&M costs increase and the system efficiency decreases so much that smaller systems cannot usually operate economically. In terms of costs, the optimal system size is in the range of 50–200 MWe. So-called Dish–Stirling systems can be used to generate electricity in the kilowatts range. 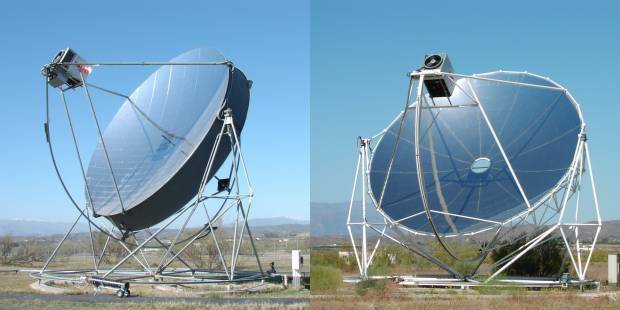 A parabolic concave mirror (the dish) concentrates sunlight; the two-axis tracked mirror must follow the sun with a high degree of accuracy in order to achieve high efficiencies. In the focus is a receiver which is heated up to 650°C. The absorbed heat drives a Stirling motor, which converts the heat into motive energy and drives a generator to produce electricity. If sufficient sunlight is not available, combustion heat from either fossil fuels or biofuels can also drive the Stirling engine and generate electricity. The system efficiency of Dish–Stirling systems can reach 20% or more. Some Dish–Stirling system prototypes have been successfully tested in a number of countries. However, the electricity generation costs of these systems are much higher than those for trough or tower power plants, and only series production can achieve further significant cost reductions for Dish–Stirling systems. All three technologies described above can only use direct normal irradiance. However, another solar thermal power plant concept – the solar chimney power plant – converts global irradiance into electricity. Since chimneys are often associated negatively with exhaust gases, this concept is also known as the solar power tower plant, although it is totally different from the tower concepts described above. 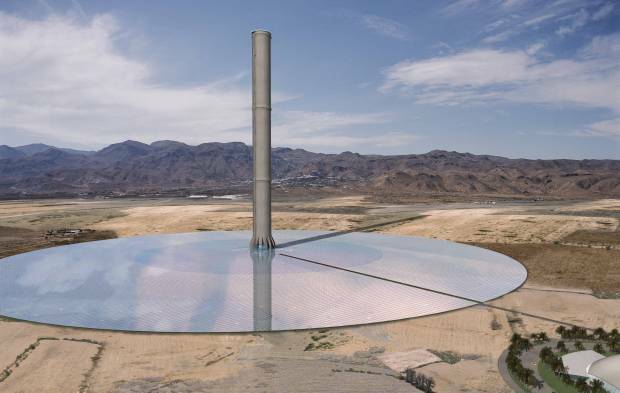 A solar chimney power plant has a high chimney (tower), with a height of up to 1000 metres, and this is surrounded by a large collector roof, up to 130 metres in diameter, that consists of glass or resistive plastic supported on a framework (see artist’s impression). Towards its centre, the roof curves upwards to join the chimney, creating a funnel. The sun heats up the ground and the air underneath the collector roof, and the heated air follows the upward incline of the roof until it reaches the chimney. There, it flows at high speed through the chimney and drives wind generators at its bottom. The ground under the collector roof behaves as a storage medium, and can even heat up the air for a significant time after sunset. The efficiency of the solar chimney power plant is below 2%, and depends mainly on the height of the tower, and so these power plants can only be constructed on land which is very cheap or free. Such areas are usually situated in desert regions. However, the whole power plant is not without other uses, as the outer area under the collector roof can also be utilized as a greenhouse for agricultural purposes. As with trough and tower plants, the minimum economical size of solar chimney power plants is also in the multi-megawatt range. Due to the poor part-load behaviour of solar thermal power, plants should be installed in regions with a minimum of around 2000 full-load hours. This is the case in regions with a direct normal irradiance of more than 2000 kWh/m2 or a global irradiance of more than 1800 kWh/m2. These irradiance values can be found in the earth’s sunbelt; however, thermal storage can increase the number of full-load hours significantly. The specific system costs are between €2000/kW and €5000/kW depending on the system size, system concept and storage size. Hence, a 50 MWe solar thermal power plant will cost €100–250 million. At very good sites, today’s solar thermal power plants can generate electricity in the range of €0.15/kWh, and series production could soon bring down these costs below €0.10/kWh. The potential for solar thermal power plants is enormous: for instance, about 1% of the area of the Sahara desert covered with solar thermal power plants would theoretically be sufficient to meet the entire global electricity demand. Therefore, solar thermal power systems will hopefully play an important role in the world’s future electricity supply.